It feels like a long time since I posted. Life has been busy over the last few weeks, with me returning to work and both the kids and myself getting sick. It's left precious little time for sewing but I've had a few late nights so I can squeeze in some me/sewing time (same thing really). I mentioned a couple of posts ago that two friends from my mothers group were due with their second babies. Well one of them has now given birth to the most precious baby girl named Ella. She's lovely, with dark hair and chubba cheeks! I spent my last afternoon of maternity leave getting some lovely newborn snuggles from her. My friend didn't know she was having a girl and was very excited when she was born. She has a home sewing business - making cot linen - so is very aware of all the gorgeous girly fabrics out there. I decided to make her a couple of pieces using Oliver + S outfits, as they never fail to impress. The first was the recently released Music Class blouse. I hadn't given this pattern much attention before, so it was nice to have an excuse to sew it. 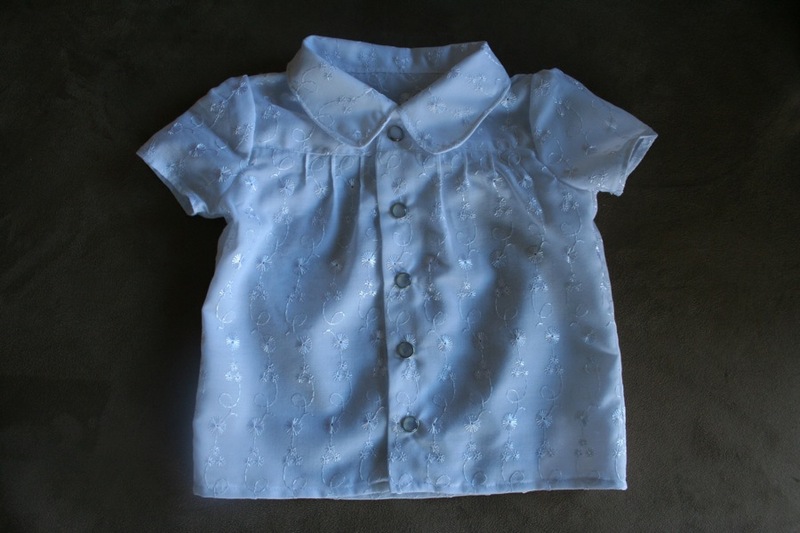 I decided to use a very soft and sheer Broderie Anglaise (eyelet lace) for the fabric, as my little girl had a similar blouse when she was about 6 months old and I loved her in it. A little lace blouse looks so sweet all dressed up with a skirt and tights, or just with a denim skirt. The pattern was great, similar in construction to the Sketchbook Shirt I made recently, although using a much sheerer fabric made the trickier bits (the collar and setting in the sleeves) so much easier. The Music Class blouse has little pintucks on the front and back and they're very sweet. I've never made pintucks before and was pretty pleased with how they turned out... although sewing them on the embroidered fabric was a bit tricky. This pattern also has a lovely little inverted pleat detail on the sleeve cap that I forgot to photograph in my rush to get the blouse to its new owner. I made this blouse in a size 6-12 months, so it's pretty tiny. I didn't want to muck around with tiny buttons, so used press studs (snaps) for the first time. 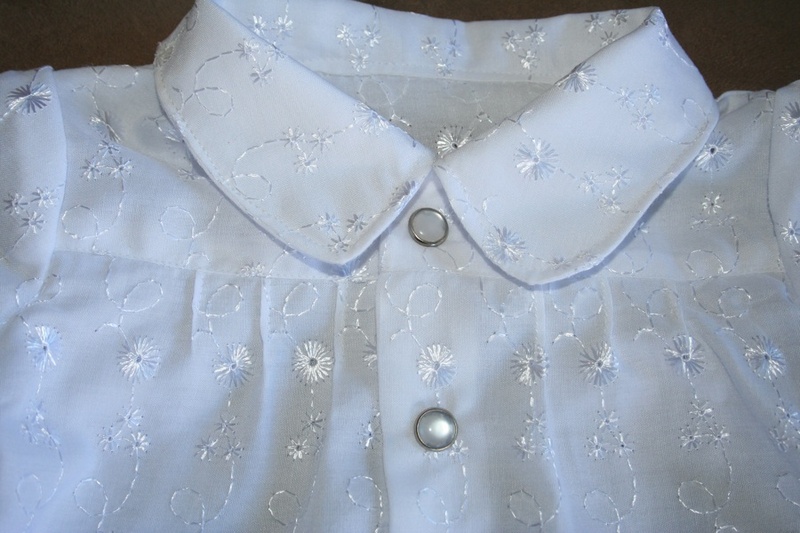 I used ones with a pearly top that mum bought for me in Hong Kong recently, and think they're perfect for the shirt. However one of them shattered as I put it in and there were some tense moments in this household as my husband tried to remove it without damaging the blouse. I really love this little blouse. I have already bought some lovely turquoise rainspot dobby to make one for my little girl this Summer. As usual I have waffled on so will create a new post for the other piece I made for Miss Ella. Pintuck detail. I love the little snaps I used too - and so much easier than sewing on buttons! That is the cutest top I've seen. Well done.